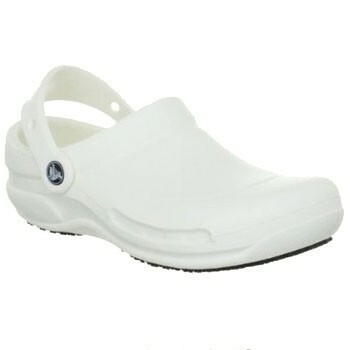 If you work in food service, hospitality, or health care, the Crocs Bistro was made with you in mind. Featuring Crocs Lock™ slip-resistant tread, the Bistro meets industry non-skid standards to keep you steady on slick surfaces. A fully enclosed toe and thicker metatarsal area will help protect your foot from spills and dropped items. Made of lightweight material, the Bistro is super cushioned, durable, and will mold to your foot for a customized fit. The footbed is contoured to provide arch support for comfort during long days on your feet, and the shoes are odor-resistant and easy to clean with soap and water. The Crocs Bistro was awarded the Gold Seal at the World Culinary Championship for "most comfortable work shoe" from the Chefs In America organization, has has received a seal of acceptance from the American Podiatric Medical Association (APMA).